When you decide to dump Hotmail and switch to use other free email or webmail service, probably you would like to export and move the contacts in Hotmail over to your new email account too. It’s very easy to move all mail messages to Gmail, a popular alternative to Hotmail and many other email services, so does copy and export Hotmail contacts information and import them into new email account in Gmail or other services. In fact, the exported contacts from Hotmail can also be transferred to desktop email clients such as Outlook and Thunderbird for local offline use. To export Hotmail contacts list to a Microsoft Excel CSV (Comma Separated Values) file (it’s the only file format provided by Windows Live Hotmail, but also the most widely acceptable format as it’s in text format), log and sign in to the Windows Live or MSN Hotmail account. Then click on the Options button on the top right corner. In the Options pull down menu, click on More Options link at the bottom of the list. In the “Options” page, under “Customize your contacts” section, click on Export contacts link. Next, click on Export contacts button. A file saving dialog will appear to allow you to save the contacts list file. Save the file in a convenient location on your computer. By default the exported file is named as WLMContacts.csv in Microsoft Excel Comma Separated Values file format. The file format and extension is fixed, however you can change and pick any filename you like. 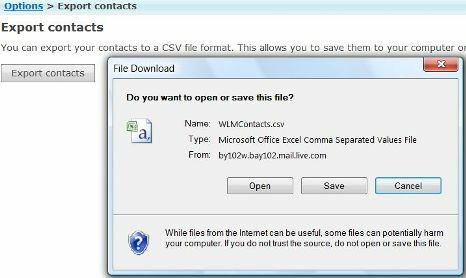 Once the exported .CSV file with contacts information from Hotmail is saved, the file can be used to transfer contacts list to another email service by using option to import contacts from a CSV file. For example, to copy and transfer the contacts in Hotmail to Gmail, click on “Contacts” page, then click on “Import” on top right corner. Select the Hotmail contacts CSV file, and click on “Import Contacts” button, and voila, all your Hotmail contacts now exist intact in Gmail contact. Other webmail services should using the same procedure. If you’re accessing your mailbox using POP3 or IMAP, import the Hotmail contacts into the mail client instead to access to these contacts information. Most email client such as Outlook 2003/2007, Outlook Express, Thunderbird, Eudora and Pegasus allow users to import contacts from a CSV file. Update: Hotmail has been replaced by Outlook.com.